Description : Wooden Tray with Ceramic tile. 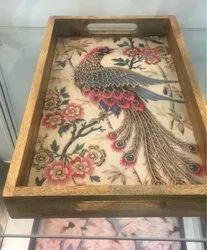 Decorative Wooden Tray With Metal Handle, Size (Inches): 20"
We introduce our business as a notable entity of qualitative array of Wooden Trays. Handmade Wooden Tray with Natural Finish for serving, gifting, storage etc. This marvelous Butler Tray is hand crafted in eco-friendly, pine based MDF for your art and craft projects. 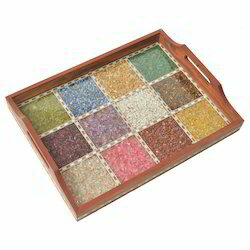 It can be decorated using decoupage, painting, mosaics and more. It has been sanded, sealed and then sanded again. The Butler Tray is perfect for service at parties. Keeping in sync with the latest market norms and policies, we are indulged in providing a high quality range of Digital Printed Wooden Tray. Rectangular MKI Wooden Tray with Brass Handles, Size: 14" X 10"
Mango Wood Tray Carved, Size: 18x12x2.5"